Holiday.gr - ANAFI, a trip to a myth! Been to ANAFI ? Share your experiences! Anafi is a small paradise, with untouched natural beauties and the authentic beauty of Cyclades islands. < It is 12n.m.east of Santorini. It has an extend of 38sq.km and it’s a hilly infertile island. Anafi, due to the disproportional shape of mountain Kalamos (460m height) in the center of the island, looks like a cone. According to mythology, this small island came out of Aegean Sea, after Apollo’s command in order to give refuge to Argonaftes. Its endless beauties make it look like Eden’s garden. 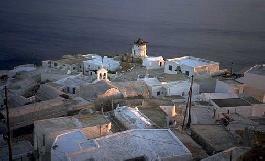 Anafi, has one settlement, Chora, where you can find rooms to let that provide a pleasant staying in the island’s visitors. Like in most small islands, Anafi impresses travelers that approach the port of Agios Nikolaos and offer them dreamy holidays in a quiet land, ideal for gaining back strength.